Oh! I don't think I've seen the Chapin living room in color before. The first shot is Sister Christina walking into the Chapin living room isn't it? As I said before, someone put the final monologue from "Rituals" online several years back. It was quite lengthy and some of the characters ended up getting rather bizarre or tragic fates. It also took place several years in the future. So these shots were suppose to be set in the late 1980s. Carter was paralyzed and had been stricken mute after someone ran them down with their car. Christina said they never found who the culprit was, but I figured Christina herself was probably the assailant. She was supposedly taking care of Carter since the accident. Jones had also played a heroine on "Lovers & Friends." To an extent, I think Christina may have been meant as a mother figure to the Chapin clan. She was BFFs with Katherine Chapin and consoled Brady when his mother died. Later, Christina decided she wanted to make house with Patrick in a very different way. I think someone realized Pflug wasn't going to play the "Alexis" role in the show and decided to soften Taylor and beef up Christina. I've seen very little mentioned about the story once Tina Louise takes over the role of Taylor. She seems to be a placeholder for C.J. as she plots to get rid of Carter from the family fold. If Pflug had stayed, I'm guessing Taylor and Logan's romance would have been featured more. "The Catlins" listed in weekly synopses, but I wish it were. 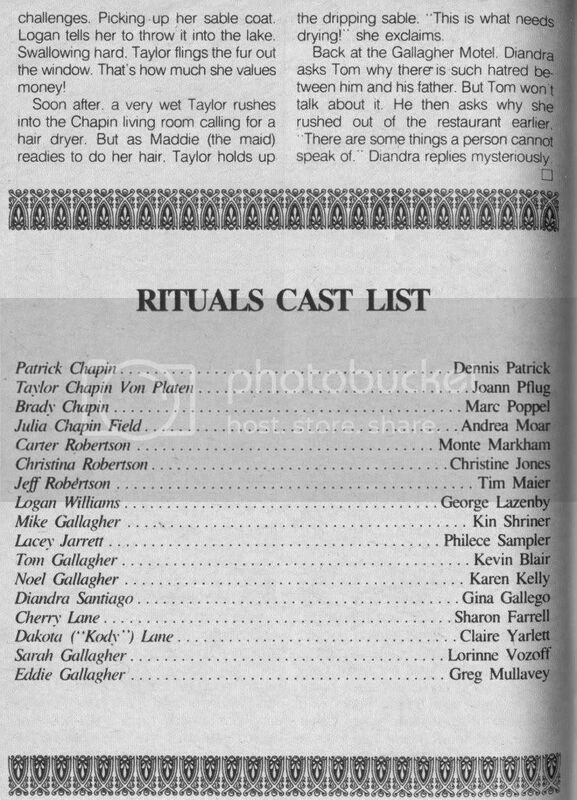 Goldensoaps, you have the last episode of "Rituals," correct? Did Diandra's baby have a name? Was Michelle's parentage talked about in the final episode? I love "Cuna de Lobos"! I've only seen the edited compliation that Televisa put out a few years back which is only a small portion of the story (10 hours or so) but it absolutely brilliant. I wish someone would reair it with subtitles. Someone was posting the entire series on youtube without the subtitles and I caught a few episodes. I think it ended in the 30s or 40s though before a lot of the more juicy stuff. I was excited about the remake initially, but I don't like how it will be a weekly series. That's disappointing. Rebecca Jones (Vilma/Catalina) is a strong actress but I'm not sure anyone can replace Maria Rubio in that role. Jones made Vilma vulnerable and sympathetic, which was a hard challenge given Vilma's role in the drama. It's probably the best baby swap storyline in soaps. Yes, I have a part of the last episode in an old VHS tape, I will watch it again and I will try to answer your questions. Due to my job, I am not at home now, and I will be there during the weekend, and I will be able to answer your questions! And about CUNA DE LOBOS; I think in a TELENOVELAS FORUM you can download it entire, but in Spanish. I remember that it was a soap of 20 minutes, with a very good plot and Maria Rubio was really great!!! Petet Haskell has left SFT to join Rituals and his family in California.He is playing Carson Fields. Thanks for finding that. I wonder what ideas Goldstone had? What other stuff had he written for? Hi DC , I have watched again the last scenes of the last episode of Rituals, and the baby hasn't got a name, they only say baby girl. And CJ tells Sarah the truth about her lost daughter, and he tells her that her daughter is Michelle. Sarah is happy and wishes to see her. They meet and mother and daughter hug. Sarah tells Michelle that her father is Patrick Chapin. Thank you for this. What a messy family tree! Upon additional consideration, I find this very suspicious. I'm not dating you, Goldensoaps, but rather if this was the story truth. Michelle had bedded both Carter and Jeff. Carter and Michelle shared a father; Jeff was Carter's son. I know Christina was involved in this plot. If the show had continued, I wonder if Sarah's illegitimate child would have turned out to be antoher character. I wonder if Christina manipulated the situation to make Sarah look bad because she had allowed her own daughter to sleep with her half-brother and half-nephew. Or did the show's final writers not have a clear sense of the show's history. This is truly a mind boggling plot twist. BTW, Goldensoaps, Sarah did end up shot after her scenes C.J. and Michelle, correct? 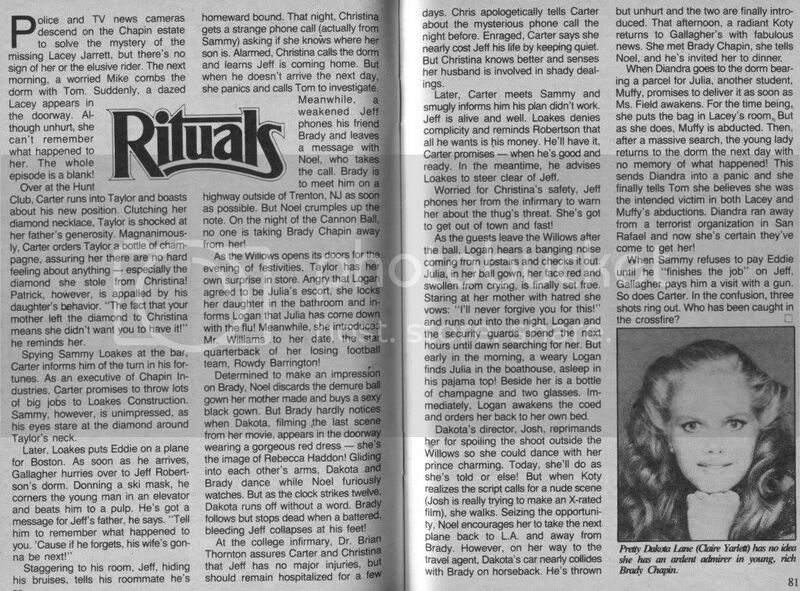 From what I've learned, the shooting of Sarah was intended to be the 'season finale' for "Rituals." The writers originally left things a bit up in the air in case the show was picked up. Once the show was dead in the water, I assume they tacked on Christina's monologue about the fates of the characters. October 23, 1984 Digest. First recap. This issue also says that Mike and Lacey will be married on October 19 and 20. This issue also says Bob Hamilton, of Bare Essence, has been brought in as a story consultant, and that the focus would shift back to the college. November 6 and 20, 1984 Digests. I find Palumbo's material for 'Rituals' rather frivolous at times. The Bernhardt / Patty / Taylor stuff seems awful, and then the couple stayed on the show. 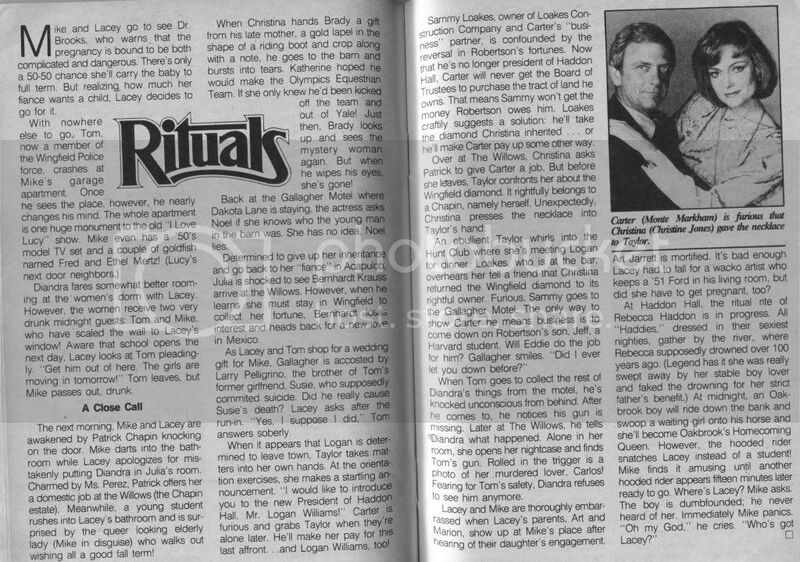 Taylor squashing the Logan / Julia pair during the Cannon Ball convinces me that Palumbo planned to reveal Julia was Logan's daughter. I'm still confused about Christina / Sara sister connection. Noel and Jeff are cousins who are dating. Without the uproar, I cannot imagine them as the pre-cursor to Jammy. There must be something we don't know liek Sara or Christina was adopted. I am curious about the fall of Christina / Carter's marriage. It sounds rather sordid, in a good way, unlike the Eddie / Suzie backstory. I'm not sure where Palumbo intended to go with Rebecca / Dakota connection, but it seemed to be something since they talked about Rebecca on several occassions. 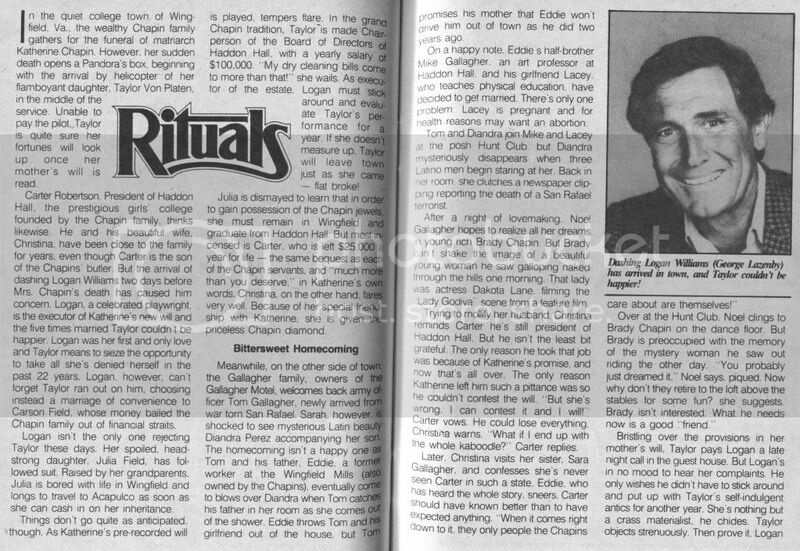 I wonder if the plan was reveal Cherry / Dakota were Haddons / Chapins before they decided to go the Carter route. Carl, SOD said Mike and Lacey would be married on October 20 and 21, but the marriage never happened. The January 15th synopsis you posted discusses Mike / Lacey's wedding, which happened around Thanksgiving. This Diandra / Mike ONS thread played out until the end with Diandra having Mike's baby in the final episode. I can see how this would cause conflict in the Gallagher family, but Mike / Lacey's story is so convoluted. The show never really focused on the college again. I think Bob Hamilton's big contribution was Mike's stalker story with Nancy or whoever the young student was, but his work may have been trunucated. In an article about a 'Rituals' Christmas party, it was mentioned everyone was celebrating that 'Rituals' had been renewed an additional six months. The original order was for six months worth of episodes. Palumbo was ousted in the renewal. I think his successor was Ann Marcus' brother who started the whole C.J. / Carter angle which dominated the show until its final days. January 29, February 12, and February 26 Digest recaps.